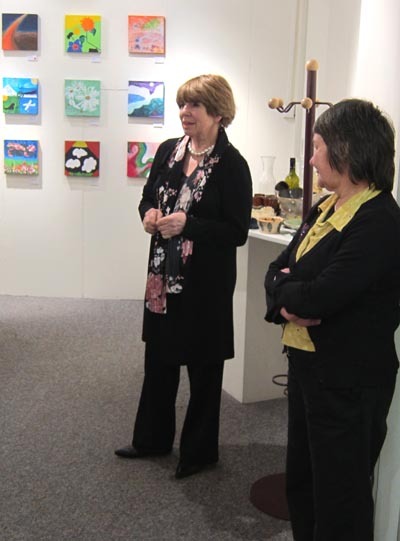 “Vincents is making Ward 27 more liveable,” said Judith Aitken, Capital and Coast District Health Board member, speaking at the opening of “Connect”, a recent exhibition in the Vincents gallery featuring some artworks by patients from the mental health unit Te Whare O Matairangi at Wellington Hospital. Vincents Art Workshop, a creative space in central Wellington, has been running weekly art sessions in Te Whare o Matairangi for more than five years. 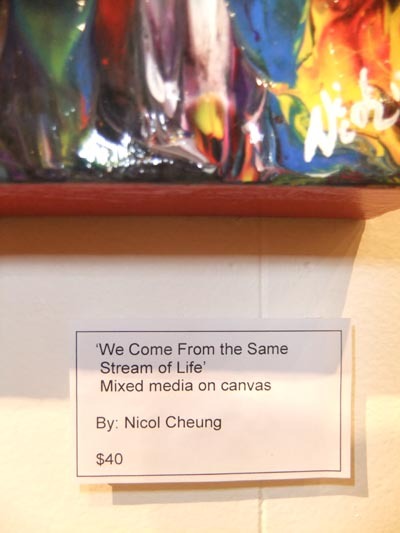 However, this was the first time patients had exhibited their work alongside the work of Vincents' artists. 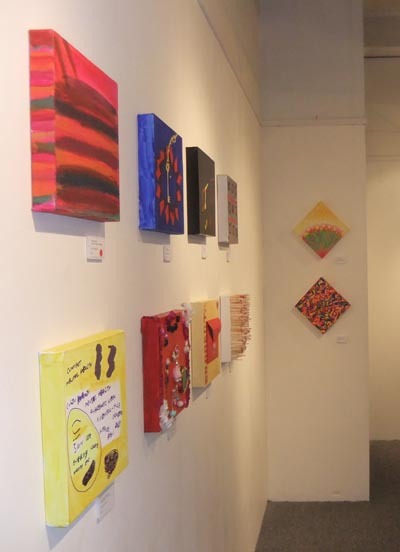 The exhibition opened to coincide with Mental Health Awareness Week from 7 to 13 October. Glen McDonald, Coordinator at Vincents Art Workshop, says that events like this help to destigmatise mental health. 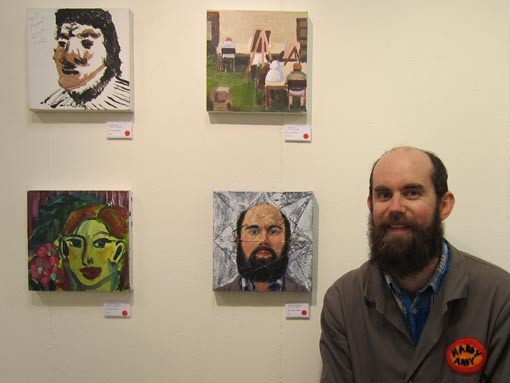 In 2007, staff at Wellington Hospital heard about the way in which Vincents used art as a rehabilitative and healing process for people in the local community. They invited the creative space to submit a proposal for art sessions in the ward. Glen says hospital staff saw the potential of what Vincents was doing to support patients’ recovery and their transition from hospital to life back in the wider community. Glen seized the opportunity and a few months later, the partnership and new service were up and running. Vincents’ senior art tutor Andrew Mitchell and art tutors Meta Assink and Simon Gray currently provide art sessions every Wednesday morning between 9.30am and noon. There’s a one-hour session with the patients in the acute ward and then a 90-minute session with other patients. These sessions offer a range of activities, including mono block printing, jewellery making, fabric stencilling, painting and drawing. Andrew says the focus is on what people can do rather than what they can’t do. This is the key to the programme’s success. Each activity is designed to be completed within the session and people often comment on how much they enjoy being able to complete something. “It’s awesome that Vincents comes to the ward and does art classes. It breaks up the week and uses a different side of the brain,” one patient commented recently. Andrew reflects on how the classes boost patients’ self-esteem. “A couple of weeks ago there was a very young guy in one of my classes. At the start, he was very quiet and introverted but by the end of the session he had produced a canvas painting that he was clearly very proud of. He told me he was going to show it to his parents when they came to visit. Another benefit of the programme is that Vincents Art Workshop provides a vital link to life outside hospital. 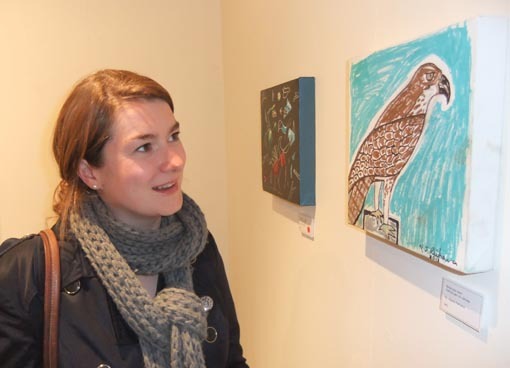 When patients have recovered and return home, they can attend sessions at Vincents Art Workshop in central Wellington knowing there will be familiar faces to welcome them. Vincents prides itself on being inclusive. “People often ask me what kinds of people come here,” Glen says. “I tell them, the kind of people you might find in the library or whoever happens to be in Wellington that day. “We have university lecturers, students, tourists, mothers, retired people, mental health service users and people with disabilities coming in every day. “It’s a service open to everyone and we don’t label people when they come here. They walk through the door, and can just sit down and create with fellow artists. Glen says that one of the positive outcomes of the partnership between Wellington Hospital and Vincents has been the extent to which hospital staff have engaged with the programme. An example of their engagement with the programme is the fact that four of the 12 contributions in Connect were by Wellington Hospital staff members. Glen says that Vincents would love to deliver this outreach project to other mental health units throughout the country. The only barrier to this is insufficient funding and resources. Original generation time 2.0011 seconds. Cache Loaded in: 0.0006 seconds.